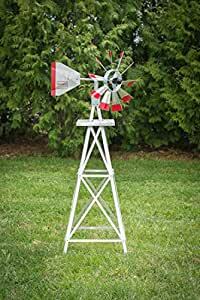 We are proud to introduce to you our line of beautifully hand crafted aluminum garden windmills! Our quality built in the USA windmills feature an all aluminum structure with stainless steel bolts and hardware, assuring your windmill will be durable and rust free for many years to come! Our windmills are offered in Green – with Yellow pinstripe. High quality decal tape assures you will never have to paint! Our 4 ft. – 12 ft. windmills feature grease inserts and bearings so that your windmill will operate smoothly and efficiently, and offering easy maintenance. Our windmills include unique ground anchors so that your windmill will be safe from wind and will be solid for years to come. We recommend that concrete is used for 8 ft. models and larger. Windmills are measured from base, to tip of fan. The 4 ft. windmill has a 14″ fan and a 15″ square base Shipping boxes are (1) 3″ X 3″ X 39″ – 6 Lbs. (2) 15″ X 4″ X 16″ – 7 Lbs. Tower components do need to be assembled, and windmill requires ground installation which is not included! Simple installation should take between 2-5 hours depending on size, ground type and skill. It is important that you check your local codes and bylaws before ordering. You must also call your local utility locating service to locate any and all utilities that may be near your windmill location site. Available in Red and other sizes, please see our store!